Temperature variation is unavoidable in the everyday operation of a design. Effects on performance caused by temperature fluctuations are most often handled as linear scaling effects, but some submicron silicon processes require nonlinear calculations. When a chip is operating, the temperature can vary throughout the chip. This is due to the power dissipation in the MOS-transistors. The power consumption is mainly due to switching, short-circuit and leakage power consumption. The average switching power dissipation (approximately given by Paverage = Cload*Vpower supply 2*fclock) is due to the required energy to charge up the parasitic and load capacitances. The short-circuit power dissipation is due to the finite rise and fall times. The nMOS and pMOS transistors may conduct for a short time during switching, forming a direct current from the power supply to the ground. The leakage power consumption is due to the nonzero reverse leakage and sub-threshold currents. The biggest contribution to the power consumption is the switching. The dissipated power will increase the surrounding temperature. The electron and hole mobility depend on the temperature. The mobility (in Si) decreases with increased temperature for temperatures above –50 °C. The temperature, when the mobility starts to decrease, depends on the doping concentration. A starting temperature at –50 °C is true for doping concentrations below 1019 atoms/cm3. For higher doping concentrations, the starting temperature is higher. When the electrons and holes move slower, then the propagation delay increases. Hence, the propagation delay increases with increased temperature. There is also a temperature effect, which has not been considered. The threshold voltage of a transistor depends on the temperature. A higher temperature will decrease the threshold voltage. A lower threshold voltage means a higher current and therefore a better delay performance. This effect depends extremely on power supply, threshold voltage, load and input slope of a cell. There is a competition between the two effects and generally the mobility effect wins. The following figure shows the PVT operating conditions. The slide says a lower temperature means a lower threshold voltage and better delay performance. But the text says a higher temperature will decrease threshold voltage. 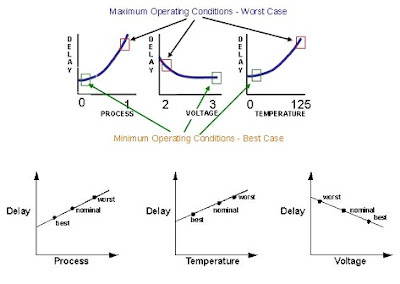 As temperature increases the threshold voltage decreases, hence increasing the sub-threshold and junction leakage. This also increases the delay and degrade the performance.